I have to share my Valentine present with you guys. 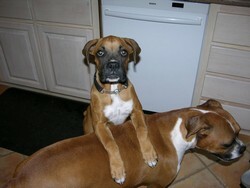 As some already know I have been with Austin Boxer Rescue since May of 2006. Rob and I started out fostering a dog from the Brownwood Rescue. Her name was Millie, well she turned into our dog… Then we took in Ian, well we failed again on fostering, and Ian is our dog too. Then we took in Neena, she came to us in November of 2006. In fact I was so proud of her she would sit, down, walk well on the leash, and well she was even totally house trained and a perfect dog for someone. She would fit into anyone’s home and heart… She is just a total love… She didn’t get put up on the site to fast do to busy things around the holidays. She was put on the site only a couple of weeks ago. I knew she would fit into anyone’s home just perfectly. She was a perfect dog .. Even though when I saw her on the boxer site, my throat got a huge lump inside, I still knew she was a great dog and ready for her new forever home…. Well as soon as she went up for adoption, the boxer site had adoption pending on her little face within days. It was so fast…. I just was not ready to see adoption pending on this dog so fast….I had had her over 3 months now, almost 4 months… 1/2 of her whole life….. I burst into tears. My first foster dog was going to someone I didn’t even know… I was happy for her, and sad for me at the same time….I didn’t even have the heart to write to see who was wanting her. I guess deep down I thought if I didn’t write maybe I could keep her a little longer…. soon…My husband then told me He had been the one that adopted her. I was totally shocked…. so I once again burst into tears…. Somehow I think this Valentine gift is more Daddy’s than mine. But we are both very happy to have her as our Valentine baby….she fits in so well…. she is the youngest, and she is loved beyond words. We are doing well with fostering now…. We both love Austin Boxer Rescue and we both are so very aware how much work, and love on all the members parts to place even one dog into a happy home, its worth all the time and effort it takes on all our groups part to place these dogs into healthy loved environments…. Thank you Austin Boxer Rescue… Thank each and everyone of you that do all the work to save our dogs. Thanks Jen, Thanks to All!